I Believe it’s time to reclaim marking and make it our own again. It’s time to establish the hard facts, analyse what the research tells us and debunk the myths. Ask any teacher across various educational contexts what is top 3 in terms of their workload burden and I predict this will always include marking; excessive, high frequency in-depth marking to be more specific. In fact, there is a wealth of evidence that rejects this practice, rendering it as ineffective and suggesting it’s reaching crisis point. I am not advocating the boycott of marking, that would be foolish, in fact, quite the opposite. Feedback is critical in accelerating learning gains, therefore, marking and when appropriate, in-depth written feedback are essential components within the teacher-student feedback loop. I don’t think any teacher will dispute this, and this isn’t the issue. Where the problem lies and the worrying part is that the effectiveness of marking has become diluted by misconceptions and blown out of all proportion by an evolution of a tick box culture that thrives in some schools. Nevertheless, this ethos will vary considerably from school to school and I sincerely hope this isn’t widespread worse practice. I believe this to be the root of the problem; inconsistency and the absence of a pragmatic approach in a realistic pursuit to marking, with respect to teacher workload and student progress. As professionals we need to nurture and exercise high levels of trust in order to do what is right for our students and preserve our own wellbeing at the same time. 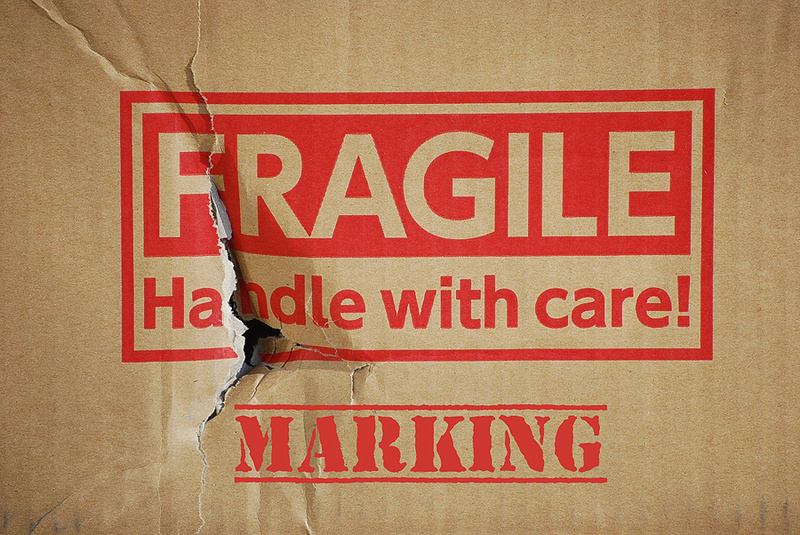 So, what then are the problems with marking and potentially what does this lead to? The worst case scenario, ultimately, is broken marking thus causing unnecessary stress which leads to a dimishing love of teaching. Firstly we need to reflect upon why we mark and not focus simply on how we mark. If the answer is to accelerate student progress and therefore outcomes = perfect! If the answer is not student centered then why bother at all? Furthermore if the answer is to satisfy Ofsted or to comply with nonsensical school policy then it’s time to challenge the mindset of some school leaders who are blinkered in their thought process and strategy around marking. 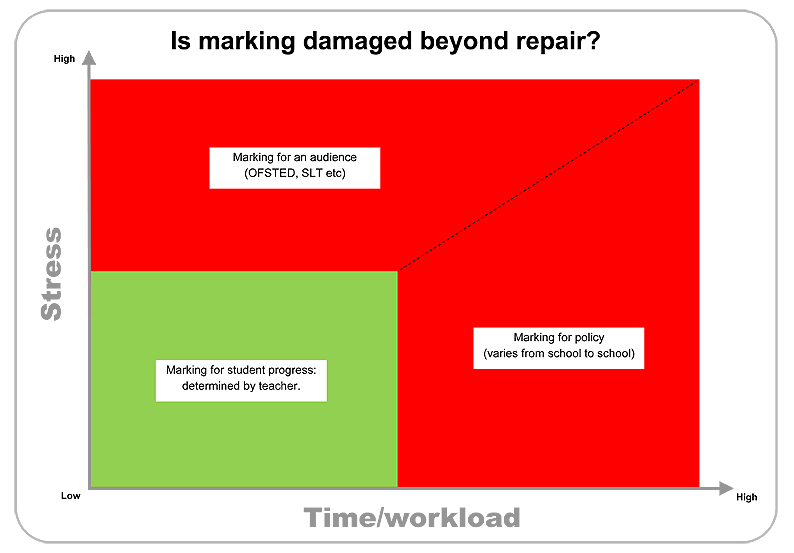 Ask yourself; is marking damaged beyond repair in your school? 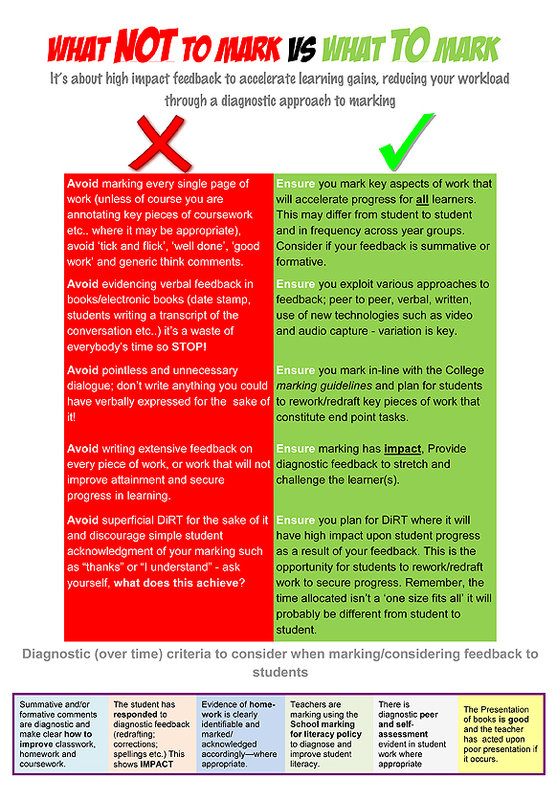 Teachers need autonomy, teachers need to be able to interpret generic policy at a subject level, which means a school’s marking policy should become more a school’s marking guidelines; not too prescriptive specifying exactly how you should mark, how many times you should mark and exactly what should be marked, but focused more towards a framework to support best practice. Marking guidelines should help to maintain rigour, ensure consistency but at the same time allow for teachers to excercise their professional judgement. Challenge the marking ‘fads’, share ideas, share what works, but more importantly determine what doesn’t and learn from it. Feedback, or more specifically formative marking should feature within a fluid and informed CPD model. Depending upon the culture in a school, book looks should not be feared, but instead embraced by teachers and school leaders as a fantastic CPD opportunity. Creating time for colleagues to reflect, discuss and explore marking and its various forms which underpin students progress is priceless and shouldn’t be overlooked or undervalued. You can read more about this in previous blog here. « Teacher Appraisal – a fait accompli?